When it comes to taking one for the team, these five players (who are still competing in the Stanley Cup Playoffs) definitely know how to step up by standing (or sliding) in front of a hard blast off the opposition’s stick. Who has the best shot-stopping stats so far in the 2017-18 post-season? Hint: Three Washington Capitals made the cut. Washington’s veteran defenceman leads the way with 34 blocked shots in the 2017-18 Stanley Cup Playoffs, averaging 2.8 per game. The 31-year-old Minnesota native has 896 career blocks during the regular season. Vegas’ shot-blocking machine – he had 176 (tying him for sixth overall) in the regular season – has carried over his puck-stopping skills into the Playoffs, with 31 blocked shots to his name as the Golden Knights have rolled on to the Western Conference Finals. Blocking 168 shots during the 2017-18 season, placing him tied for 12th overall in the League, Orpik has picked it up again in the post-season, blocking 28 shots for the Capitals through 12 Playoff games. After setting a personal-best mark with 116 blocked shots in the regular season, Washington’s No. 9 has kept it rolling in the Stanley Cup Playoffs. 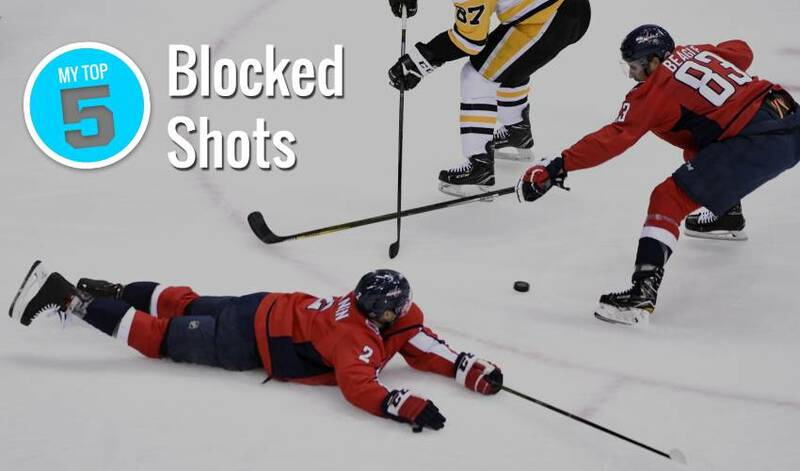 After 12 post-season contests, the 26-year-old has 26 blocked shots as the Capitals prepare to take on Tampa Bay in the Eastern Conference Final. Despite being limited to 55 regular season games in 2017-18, the Jets blueliner blocked 100 regular-season shots. In five NHL seasons, Trouba has reached the century mark in the category each year, including a career-best 177 blocked shots in 2015-16. In this week's Player Q&A, we learn that Jacob Trouba is probably looking forward to the return of one of his favourite shows.